Appreciator is an upvote bot that holds a serious amount of clout! Which will have a value of approx. $5 each. We all know what a HUGE difference that extra value can make in terms of visibility on Steemit! each with our own strengths, passions and input. goes the extra mile for one another. chat directly, engage, share content and get consistent support on your posts. This is a place and space for Steemit creatives that KNOW their value on this platform! The ones that put EXTENSIVE hours into what they share. The ones that WANT to make a difference. The ones that NEVER SAY DIE! The ones that have ENDLESS enthusiasm! Your most welcome to join it. It would be great to have you on board. Ignore if you have already joined it. Thank you for reading this comment. Have a nice day. Image downloaded to my phone since the majority of my posting and interaction is from there. I am happy to be a steemit blooger. @jaynie good effort for bringing the community to the great height. This is great news, I'm really excited about this idea. How does he work? Should we send one SDB? Great News!! I'm really glad to be part of such a great group of people. Thank you @jaynie. Looks like a great group to be part of! Cool, I am all into this :) just joined the Discord too. This is such a great news for all those a part of @steemitbloggers and this explains that wodnerful and generous upvote on my Batman post. You are our guardian angel @jaynie for sure! #Steemit Bloggers. ( #Way to Go StemmitBloggers ). # This is awesome for anyone who joins the community. #Sorry for the big #s.
Ah! This is such great news. I am so glad to be part of the Steemit Bloggers Community. So much positivity and support on there. Looking forward to more people joining us. Hey @jaynie. That is really awesome. I think I have come across @appreciator before. Very welcome for all of us the #SteemitBloggers! Sounds awesome! Can I be part of it even if my blogging was not consitant the last few weeks? im so glad I hopped onto the steemitbloggers when i did. I'm going to try to curate as many of the great hip hop artist we have on here and really up my game now :). 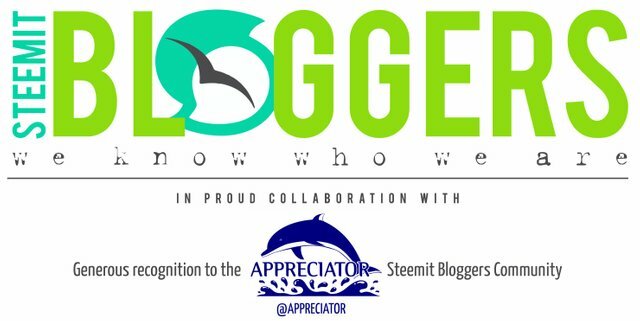 i appreciate your efforts for steemit bloggers. Very well done and keep it up good work @jaynie! This seems like a great way to build closer community! Awesome news. Well done. Exciting times ahead. Now that is big news for #steemitbloggers community. Dude.... don't spam your name here. Seriously?! Why are you so angry with him?? Because he was spamming his username on everyone's comments. Alright. Got that. Have a nice day. Hope you and yours are well and loving life today. So, I just read and comment on at least one post from a channel daily? Pretty much you got it, but you need to upvote and comment, not just read and comment. lol. I'm sure thats what you meant. And it needs to be in a different channel each day until you've gone through all the channels. Glad you have you on the team @jaichai! "Many precious thanks placed at your feet, Sahib."